ThinkRF Corp., the leader in software-defined spectrum analysis, today announced the release of the new ThinkRF R5550 Real-Time Spectrum Analyzer and ThinkRF R5750 Real-Time Spectrum Analyzer with Global Positioning System (GPS). Designed to be sleek, lightweight, and silent, the new analyzers offer improved spectral performance, lower power consumption, and better portability at a more cost-effective price. 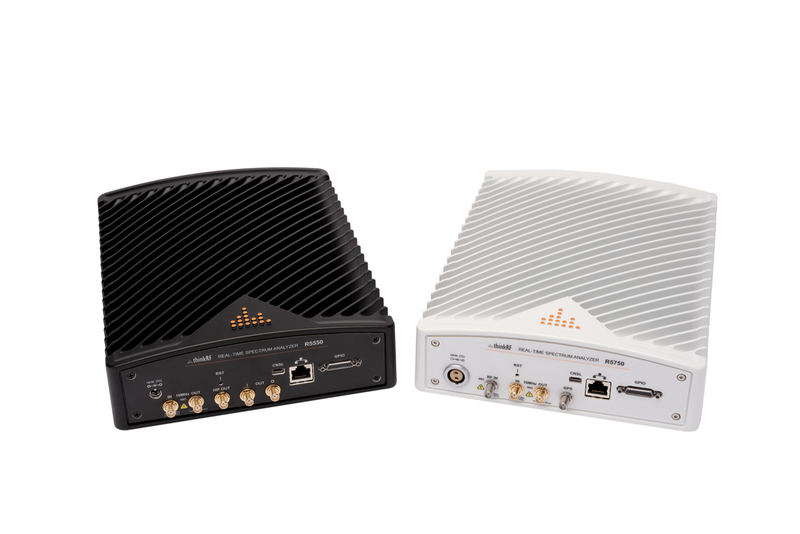 The ThinkRF R5550 and R5750 analyzers are built for outdoor, mobile, and distributed deployment scenarios, including regulatory and intelligence monitoring, telecom deployment optimization, and RF application development. Users can deploy units in a variety of network architectures, analyze signals in real-time or later, and easily integrate with leading software applications to conduct demodulation or deeper analysis of signals up to 27 GHz. The R5750 analyzer includes an embedded GPS for time and location data, and comes with an optional IP66 rating for increased durability and ruggedness in difficult environments. Both the ThinkRF R5550 and R5750 analyzers are available for order immediately.